This is the Map of Orsterra I have painted for the Nintendo Switch game "Octopath Traveler" by SquareEnix. A real pleasure, dear friend, Francesca! I love Octopath traveller, and this map is amazing. I would love something like this printed on a cloth for my games room... I can only dream. You must get asked this all the time, but how long does it take to paint a piece of art like this? I've been working back and forth on this map for approx 6 months. But in general a map like that would take me 4-6 weeks to complete it. Cool, all your maps are very impressive. I have always found video game maps very interesting. Do you know if the Octopath traveller map is inspired by europe? The bottom left looks like Spain and the top right it looks like a small Italy. Sorry for all the questions, just one last one. Did Square Enix give you the shape and then you created a fantasy map, or did you have more freedom in the design? I have been provided by Square Enix with a rough layout of the landmasses. I don't know if they got inspired by the shape of Europe. Cool, thanks for the information. Keep up the excellent work! Wait, YOU made it? That's AWESOME. Thank you! No need to be depressive, just keep on the great work! Thanks Being depressed grows into motivation! My son mentioned this game a few days ago, said he thinks I'd like it, and it sounded familiar to me. This map was the reason why. Great work! Wow, that is amazing! And congrats on landing a Nintendo commission, that's really cool! Thank you very much! Yes, I feel super lucky! 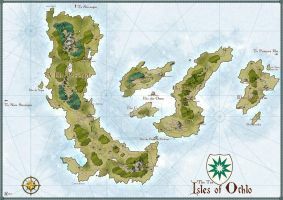 your fantasy maps never fail to impress me... outstanding work! I have a question, though. Why did you have to do two different maps for this game? I've done the first one as a test map and it was used for the teaser trailer of the game. The second one is a bigger map and has been used for the final game. Your borders inspire! Your variety on the map immerse one completely. The way you blend the colors to each other is truly thought provoking. And I'm so happy for you that you got picked up by Square Enix for this, well done! I have painted a lot of these tiny sea illustrations but only a few have been included in the map. Simply incredible... Square Enix couldn't ask for a better map. It fits in so well. Wonderful job! It’s a real treat to meet the person who made the map for such an anticipated game! Stunning artwork! So many details to discover... looks like weeks of concentrated work. I admire you! What papersize do you actually use für your maps? I use different papersize depending on the map (starting from A3 size). This was one of the biggest map I've done ...I think it was bigger than A1 size. Ho pensato già che ci vuole un formato della carta più grande di come A3 per una carta tanta dettagliata come la questa carta. Allora fotografi le tue carte quando tu sei finito o scansisci pezzo per pezzo e combini con Photoshop? D'altronde mi piacono le tue carte specialmente perché il loro stile veramente è inconfondibile! Una qualità, che io cerco personalmente in proposito di la mia arte anche. Grazie! Sì, scansiono digitalmente le mie mappe.